Yorkshire folk might be proud of their White Rose heritage, but does it hide a slightly uncomfortable truth? Martin Hickes reports. Most school-children know of the bloody Wars of the Roses, and the clash between Lancashire and Yorkshire. Yorkshireman, author and historian Peter Algar, who has researched the period of the Wars of the Roses extensively, and who is an associate of the Towton Battlefield Society, says the truth is bound to surprise many. “The House of York at the time were largely southerners to a man; while it was the House of Lancaster which would have held sway across the North – and that includes using Yorkshire as a recruiting ground. “In my general experience as an occasionaly lecturer on the subject, the public – especially die hard Yorkshiremen - do not like being appraised of this. They have long held views of a geographic Yorks vs Lancs conflict. Look at the cricket and Leeds Utd v Manchester Utd or Leeds Rhinos v Wigan Warriors today. 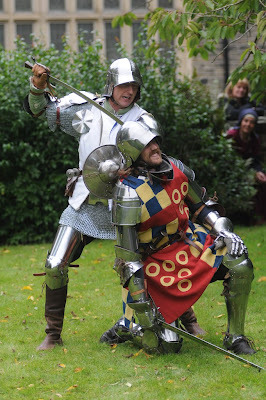 · Peter Algar is the author of the popular Yorkshire novel The Shepherd Lord, is an associate member of the Towton Battlefield Society and has lectured and written widely on the subject of the Wars of the Roses.